Jan 31, dinner. 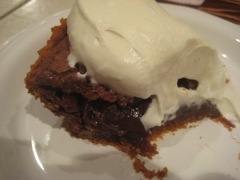 Jan's chocolate chess pecan pie, made from scratch, with whipped cream. Woo hoo! At home with family. 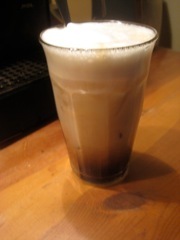 Feb 1, breakfast. The usual. Feb 1, snack. 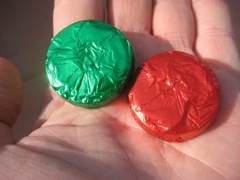 Two chocolates. Feb 1, lunch. 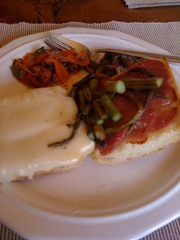 Sandwich of salami, cheese, asparagus, and a bit of red pepper salad and mushroom salad on the side (leftovers from tapas on Saturday). At home with Jan.
Feb 1, dinner. 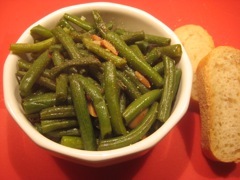 Green beans and almonds. At home, by myself. 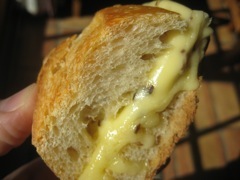 With some bread. 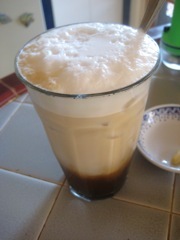 Feb 2, breakfast. 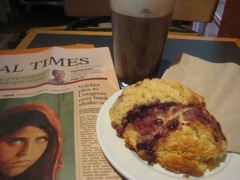 Raspberry scone and iced medium cappuccino at Raging Sage in Tucson. Feb 2, lunch. 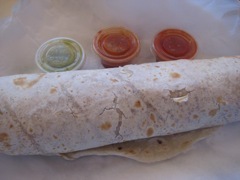 Shrimp burrito from Nico's in Tucson. Feb 2, snack. 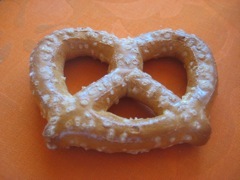 A pretzel. From Sunflower Market; they have pretty good pretzels in the bag. Solid, good tasting. Not soggy or too salty. Feb 2, dinner. 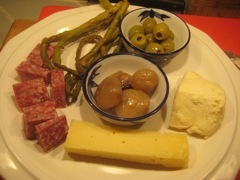 Grazing plate of olives, onions, salami, some leftover asparagus, St. Andre cheese and some aged Spanish manchego. Feb 3, breakfast. Raging Sage. 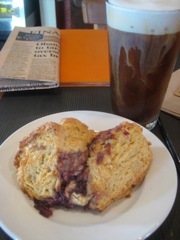 Scone with iced cappuccino. Feb 3, lunch. 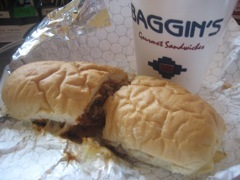 Baggin's Albuquerque Turkey sandwich, and an iced tea. At Baggin's on Ft. Lowell in Tucson, by myself. 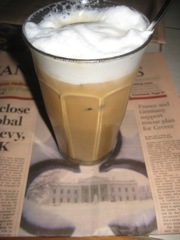 Feb 4, breakfast. The usual. Jan's home! Feb 4, snack. Some champignon brie (actually, it's German, but they like to put it in French, because I guess even the Germans think that French food sounds better tasting than German food) melted in a bit of fresh bread. Feb 4, lunch. 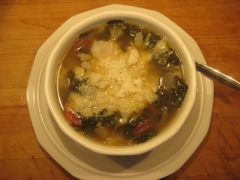 Jan's Caldo Verde soup. At home. Feb 4, dinner. 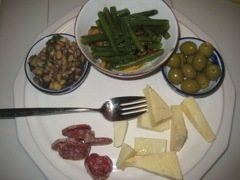 Sausage, St. Andre cheese, olives, leftover green beans with almonds, and some leftover mushroom/pine nut tapa from the other night. At home. 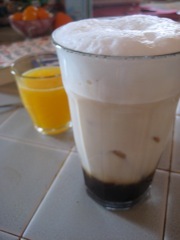 Jan 5, breakfast. The usual. Jan 5, lunch. I got this Kozo lamp for Christmas, and they tucked this chocolate bar in the packing material. 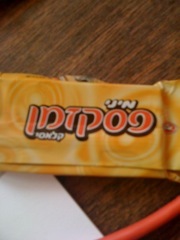 It was a chocolate bar, nothing really special, but tasty enough. A bit like a Kit-Kat. In the office in Tucson. Feb 5, dinner. 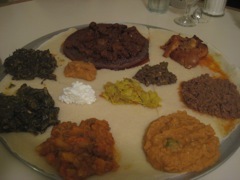 Zemam's dinner with Rose and Mark and Jan.
Feb 6, breakfast. The usual. Feb 6, lunch. 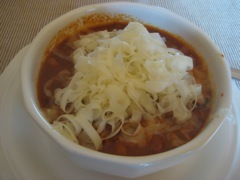 Joel's pork chili with a ton of cheese grated on top. Delicious. At home with Jan.
Feb 6, snack. 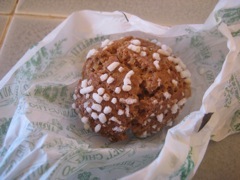 An Amaretto cookie. Tasty. Feb 6, dinner. 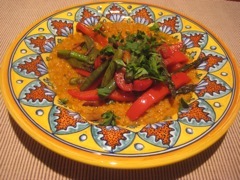 Some red lentils, and on top, asparagus, red peppers, and green beans, with a bit of parsley. 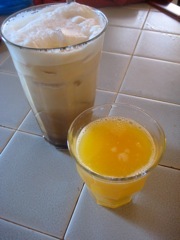 Feb 7, breakfast. The usual. This was followed by stomach flu and I didn't eat anything for two days. Ick. 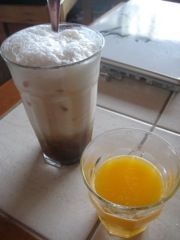 Feb 9, breakfast. Done with stomach flu, or mostly done. I'm having the usual. Feb 9, lunch. 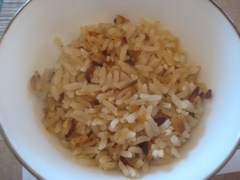 Some leftover rice. About all I could take. At home with Jan.
Feb 9, dinner. 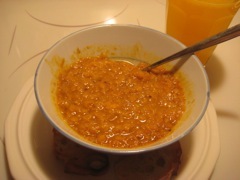 Red lentils, left over. 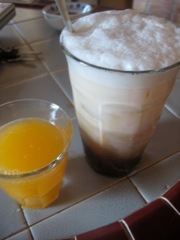 With some dilute orange juice. At home, with Jan.
Feb 10, breakfast. The usual. Feb 10, dinner. 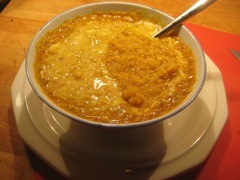 Back to red lentils, this time with some yogurt mixed in. 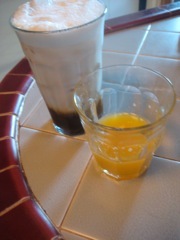 Feb 11, breakfast. The usual. Feb 11, lunch. Finally feel good enough to go out. 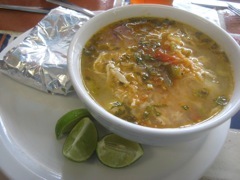 Went to Rosa's and had chicken and rice soup. Good for what ails you.